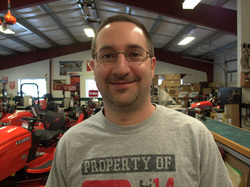 The newest member of the Exit 18 Equipment family is Roger Parent. We are extremely fortunate to have Roger and his wide range of skills here at Exit 18. Roger comes to us from Ride-Away Handicap Equipment in Essex. He served as their Service Manager installing and repairing equipment in vehicles for people with disabilities. He was at Ride-Away for 6 years. Prior to that he honed his technical skills in the high volume fast paced shop at 197inc in Essex, servicing outdoor power equipment for 12 years. Roger resides in Milton with his wife and 6 kids were he is an asset to his community as well. He served on the Milton fire department for 10 years and has spent the last couple of years volunteering his expertise as a Firefighter/Engineer for the Colchester Center Volunteer Fire Company. He has extensive skills in small engines, outdoor power equipment, hydraulics, electrical and all things mechanical. This combined with an exceptional work ethic and attention to detail will bring our shop to a new level of excellence to the benefit of our valued customers.